To some the idea of harvesting a doe while she’s pregnant just sounds bad. While we cannot visually judge whether or not a doe is pregnant until late in gestation, hunters in the woods during late season can logically assume that does harvested after peak rut will nearly all be pregnant. Whether or not we should harvest does in late season when they may be carrying fawns seems to be a heated subject with much disagreement. In this article, I will analyze a couple schools of thought on late season doe harvest and the merit behind them; however, we first must consider our objectives. Often, I hear guys saying they won’t shoot does late season because they feel it is greedy, unethical, or poor management to take multiple deer with one shot. From a management perspective, there is nothing biologically wrong about harvesting pregnant does or even doe fawns, if that helps you reach your management goals. In fact, there is little difference between harvesting a doe in October vs. January. In both cases that doe will not reproduce the following summer, leading to the same net loss of deer from the property the following year. Others oppose late season doe harvest because they are afraid that the next trophy buck they hope to harvest is being carried by the pregnant doe. This reasoning is not well-founded either because as much research has shown, somewhere around 75% of yearling buck fawns disperse their first year, and half of fawns will be does. So, the likelihood of any buck fawn born on your property living in your hunting area is very slim. In fact, only approximately 12.5% (give or take) of fawns born on your property will be bucks that remain for their first year of breeding. The chances that a buck from that 12.5% lives to maturity and you actually harvest him are even slimmer. As with any harvest decision, we must first consider our management goals. Hopefully at this point you have done trail camera surveys, collected observation data, and collected deer harvest data to inform a well-informed doe harvest objective. Your ability to harvest does and meet these objectives will depend on your schedule and opportunity at deer, so it’s not always as cut and dried as it seems. Whether you harvest does late in the season will likely depend on how efficient you are at meeting your doe harvest objective early. If your doe harvest goals are low or moderate you will hopefully have already met your harvest goals before the rut, so late season doe harvest will be unnecessary. If you have high doe harvest objectives, you will likely have to harvest does all season long. That being said, late season doe harvests can be very crucial in meeting deer harvest objectives and can make doe harvest easier when deer are concentrated on food sources. We should not be apprehensive about harvesting does late season when they are likely pregnant. 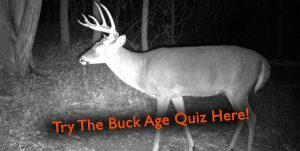 When we really examine the biology of deer and the practice of deer management, doe harvest objectives should be the deciding factor on how many and at what time we shoot does. With that said, I encourage you to harvest does at every opportunity you have, until you have met the doe harvest object outlined in your management plan. Happy hunting!